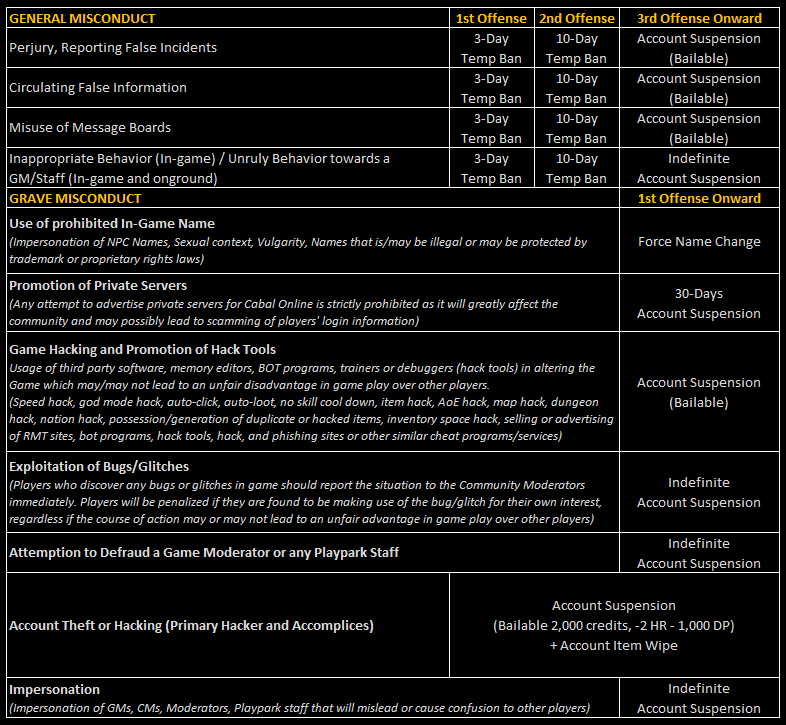 Below you may find the Official Game Policies of CABAL Online PH. These policies were built on the belief that fair and balanced gameplay is crucial for every CABAL gamer to have the best gaming experience. These policies were enacted to protect the game from those who wish to abuse or engage in illegal activities that may ruin game balance. May these policies always guide you to do only what is right, fair, courteous and legal. Take note that these game policies do not cover everything. Some cases may have to be investigated and assessed differently or exclusively by the Game Masters. Players are advised to safe-guard their own accounts as they are responsible for any actions done using it. Accounts that are caught for illegal activities will face penalties as stated, regardless of whether the illegal activities were done by the rightful owner or otherwise. Please be guided accordingly of the Game Policy, Penalty and Offenses. In accordance with particular PlayPark policies, as they are provided on our company website and sub sites, certain penalties are imposed on accounts for violating the PlayPark Code of Conduct, and for any of the violations that are listed below. It is the responsibility of every customer to be aware of our Company Policies, violations, and penalties as agreed upon in the My Level Up! End User License Agreement. Claims of ignorance to such information shall not be excused. Listed here are the general account penalties maintained by PlayPark as a company. There also exist game-specific account penalties. In most cases, game-specific account penalties will take precedence over our general company account penalties. However, please remember that depending on the nature of each violation, either company or game specific penalties may apply, the choice of which, rests on the sole discretion of PlayWeb Games Inc. Please read through the enumerated violations carefully. For questions or concerns, please contact PlayPark Customer Support. All penalties listed above are arranged into standards dependent on the general nature of each offense, but are subject to any adjustment as deemed necessary by the sole discretion of PlayPark . All violations are validated through the actual observation of PlayPark Game Moderators. PlayPark has no obligation of presenting evidence related to any cases it has ruled upon. Stay updated about Cabal Online PH by following our official social media channels!